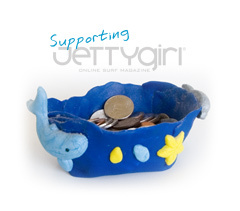 JettyGirl readers often ask us how they can help support our mission. Using this site is completely free and will continue to remain so, but we do have operating costs. If you'd like to help out, please use the "Donate" button below. You can enter any amount you desire ...whether it's $5, $20, $50 or any amount in-between or above, we'll use every penny to continue promoting women's surfing. *Please note that your donation is NOT tax deductible. Your donation is simply a voluntary subscription to our site, a few coins in the tip jar so to speak.